Why Look Under the Hood? Can I Use MEL Without Scripting? How Does an Expression Work? Is Maya’s Expression Language the Same as MEL? What Is a MEL Command? What Is a Utility Node? When Should You Consider Using a Utility Node? Trying to learn Maya programming from the documentation can be daunting whether or not you are a programmer. 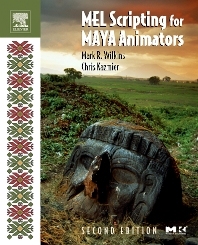 The first edition of MEL Scripting for Maya Animators earned the reputation as the best introductory book on MEL, Maya’s scripting language. Now fully revised and updated, the second edition also includes new features, such as a discussion of global procedures, new chapters on fixing programming bottlenecks, advanced user interface techniques, and optimizing character rigs. New chapters on utility nodes and Maya's Web Panel feature provide new ideas on how to use MEL in applications. "This new edition is – as was the first edition – the very best of an extremely small number of books that even attempt to cover the subject of scripting animation. The authors take great pains to explain where pertinent features, graphs, and editors are found, and to paint a picture of the interconnectivity of Maya’s various networked nodes. Mark R. Wilkins is a technical director at DreamWorks Animation SKG, where he helped develop a production pipeline using Maya for effects and character animation. Mark also provides training and technical assistance to animators using Maya. He previously worked at Walt Disney Feature Animation in a variety of positions including software engineer and scene setup supervisor. He has contributed to a number of films, including Dinosaur, Mission: Impossible 2, Minority Report, and Madagascar. Mark holds a degree in physics from Harvey Mudd College. Chris Kazmier is a senior technical director at Sony Pictures Imageworks, where he creates computer-generated effects for live-action films. He has worked on projects ranging from The Haunted Mansion to Sony's first all 3D feature animation Open Season. Previously, Chris worked at DreamWorks on Sinbad and at PDI/DreamWorks on the Intel Aliens ad campaign. Credits also include Fox Animation Studio's Titan AE and Anastasia. Sony Pictures Imageworks, Culver City, California, U.S.A.